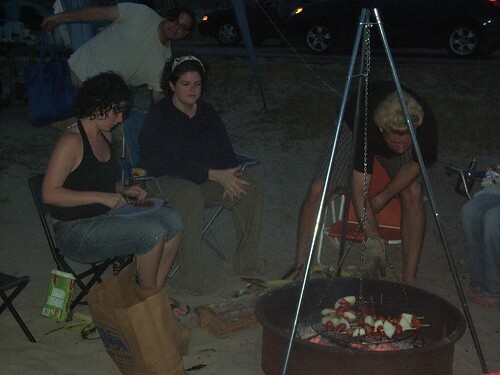 a lovely time was held by the core of the usual gang of assateague campers. mariss, kelly, ruthie and I drove down sat. and stayed over at dad and maggie’s site (such brilliant hospitality!) and then we moved over to our very own sites on sunday. it didn’t rain until wednesday night, and we were leaving on thursday anyway, so the good behavior of the clouds in quitting the drizzle when we woke up long enough to pack up camp was pretty wonderful. have you ever? seen? 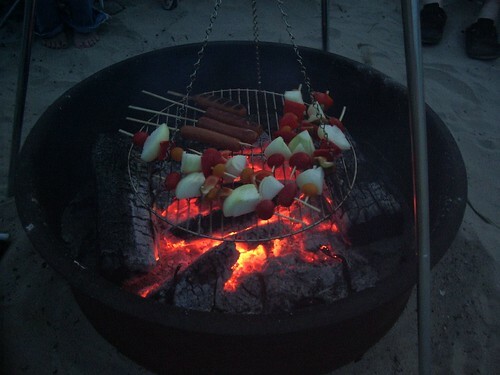 such amazingly grilled hotdogs? beautiful. also pictured above is night two of our pirated wood. we didn’t buy any wood this trip and I think we had fires all four official nights we were there! it was great – I hate buying wood. 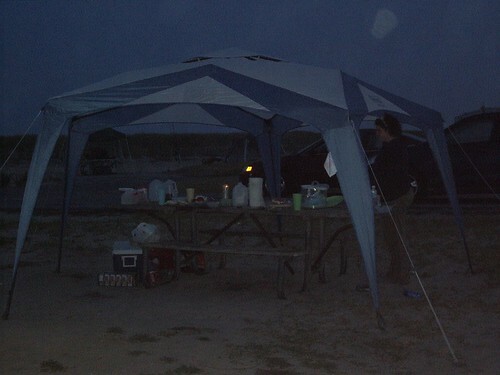 it pays like gangbusters to get to assateague, stay overnight in your parent’s 5th wheel, and to pirate wood from all vacated campsites in the vicinity before the camp hosts or the other campers get a chance to do so. actually, someone drove by while we carried huge armloads of wood and yelled “PIRATES!” and I could only toss my head (roguishly) and grin in (bloodthirsty) acknowledgement because my arms were hella full of my plunders. it’s a terrible dismal photo but you get the gist: with this beautiful canopy we were able to dawdle over breakfast without feeling a desperate need to lather up with sunblock and dash to the beach to avoid the hot hot sunrays. it was so luxurious. we took it down on wednesday in anticipation of the rain and even though it was cloudy and post-breakfast, I missed it badly. lovely time had, regardless of my short workfest at the local starbucks. what is it about the starbucks that makes tourists feel so comfortable? I’m not talking about me here. I was there as a displaced businessperson, not a tourist. and oh, lordy. how about 1 pound of alaskan king crab legs for $9? waterman’s, you had me at all you eat crabs, but your half price appetizer and two dollar bloody mary’s were just what the doctor ordered this trip. amazing. even if king crab is almost too hedonistic for me to eat. so much meat, and so little work! it’s ridiculous! almost shameful! and I’m back to work today, in what might be the best planned return from vacation ever. happiness is returning for one day to a pushed back deadline and a three-day weekend. oh, and the brilliant photo I took of myself on friday night when I got home, I added it to the last entry. ha!